Badminton giant, China, has representatives in almost all categories except for the Men’s Singles where their leading man Chen Long suffered a shock early exit on Thursday. Making their first debuts in Super Series Finals are Kento Momota, Sun Yu, Pratama/Suwardi, Ou DN/Yu XH and Lu K/Huang YQ. The formidable Zhang/Zhao are the clear favourites to win back to back Super Series Finals and what would be a third title in 2015 in a superb start to this year. China mixed doubles pairs have dominated in the Super Series events as they have swept all four titles so far, All England-India Super Series-Malaysia Premier and Singapore Super Series. Two finals in three weeks, but it has been up and down by world #1 Matsutomo/Takahashi. They lost to Ou/Yu in the first round last week in Kuala Lumpur and the outcome may be reversed today against China upcoming pair. 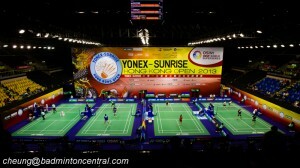 The top-seeds disposed of former world champions Wang/Yu with combination of attacking and solid defence. An interesting development by the Japanese pair. The most surprising finals matchup between 33 years old Hu Yun v 21 y.o Kento Momota. No one could have predicted both of them defying the odds to meet at last round. Based on their head to head, the Japanese rising talent is favoured to win as he eliminated Hu Yun tamely in Malaysian Super Series Premier event last week, but don’t underestimate this vast experience Hong Kong player. It was a similar pattern for Hu Yun after the Japan Open last June when he beat two big names there, Chen Long and Jorgensen. There he finished as runner-up losing to Lee Chong Wei. So, who will win today? One thing for sure, we have one new Superseries champion. The fourth meeting of Tai TY-Sun Y, same age between two players, they met once at junior stage. The Taiwanese Tai has lost to Sun Yu in all previous encounters, one of her losing happened in today final’s same venue two years ago. It will be an exciting showdown to watch. How will the creativity of Tai TY will apply strategy to cope with tall Sun Yu who has shown rapid improvement in the last 6 months. A second Super Series final this year for Fu HF/Zhang N after All England last month. On paper, this should be their own title but the underdogs Pratama/Suwardi may derail their ambition. The Indonesian back up pair performed excellently to shock hot favourites, Lee YD/Yoo YS, and also third seeds Endo/Hayakawa in a thrilling match yesterday. Will they do it again in the final?